Marine Corporal Carlos Garcia was on his first deployment when he was severely injured in an improvised explosive device (IED) blast in Sangin, Afghanistan on Nov. 20, 2010. While on a foot patrol with the 3rd Battalion, 5th Marines, Cpl Garcia was in a familiar area near a canal that was frequently used by his squad when he stepped on an unidentified IED. The resulting injuries were so severe that both of his legs required amputations above the knee. Lifesaving measures by his Corpsman and one of his best friends prepared Cpl Garcia for medical transport by helicopter. Reciting the Our Father prayer aloud, Cpl Garcia was evacuated by helicopter and placed in a medically induced sleep. Waking in at the Bagram Hopsital, Cpl Garcia was prepared for transport to Landstuhl, Germany before arriving at Bethesda Naval Medical Center where he remained for two weeks enduring surgeries and rehabilitation before being transferred to Balboa Naval Medical Center in San Diego. Carlos enjoys spending time with his wife, Jacki and their daughter and son. Time with his family is very important to him. A member of the Wolfpack wheelchair basketball team, Carlos enjoys playing competitively. Being a part of the team’s success winning first place at a competition in February 2013 was a proud accomplishment. Carlos enjoys staying active and has handcycled in five marathons to date. He and Jacki are both back in school, Carlos is pursuing a degree in social work. Carlos is grateful for the support of those who helped make his specially adapted home a reality. 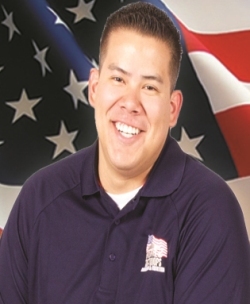 Since receiving the home, he has become an advocate for HFOT and often attends the events of other HFOT Veterans. He and Jacki have also paid it forward for other HFOT Veterans by running for Team HFOT.